First impressions last. We can create a unique logo and branding strategy to engage your audience and build brand awareness. With options for logo design, business cards and flyers to signage, photography and custom packaging our designers can work with you to create your complete company branding. As the Mornington Peninsula’s premier printing provider we can also turn your designs into print faster and cheaper than any of our competitors. We can even organise large scale signage installations for your business. Contact our design team for a free quote. Bounty Boxes creates high quality, premium gift boxes. These are perfect hampers for businesses to give to corporate clients, each containing products from boutique Australian businesses. Positive Design teamed up with Bounty Boxes to create a unique, professional hamper brand that differentiates itself to everything already in the market. 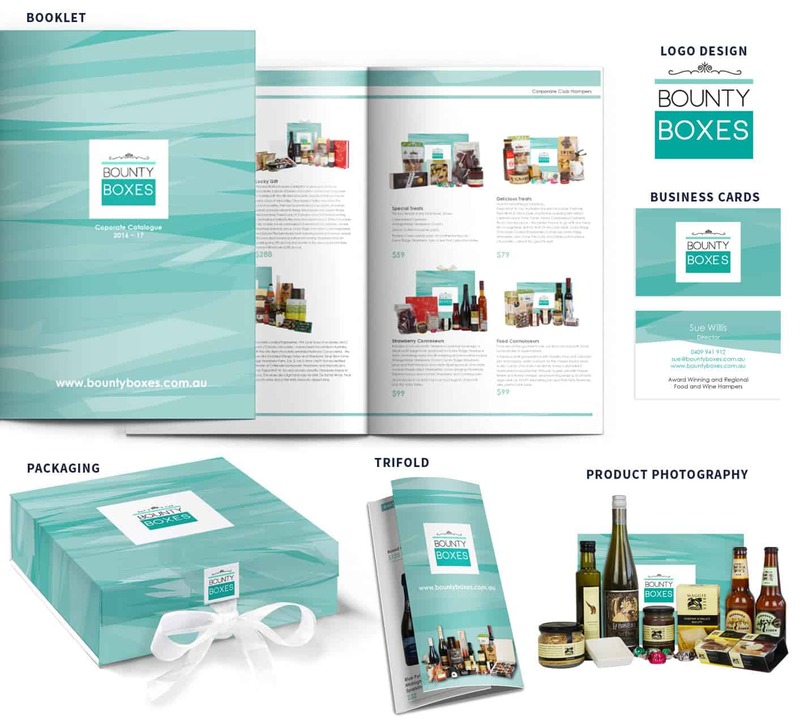 With premium design and branding combined with high quality photography the quality of Bounty Boxes products is mirrored in their website and promotional material. From designing the initial concept, creating colour palettes, providing photography and creating a user-friendly UX to building an adwords campaign and targeting relevant keywords with SEO, we have been involved with Bounty Boxes from stat up to it’s present state. The site features an easy to use eCommerce backend, built on wordpress with analytics and social media integrations. We have also built an email marketing funnel within which Bounty Boxes is building their own audience to market to. The ability to also provide printing and packaging appealed to Bounty Boxes. We have worked together to create unique packaging in-house and premium product catalogs. Find The Best Agent are one of the bigger players in the competitive real estate vendor advocacy industry. With many established businesses FTBA needed to differentiate themselves with superior customer service and a more hands on approach than most advocates in the industry. They wanted this to be reflected in everything from their branding and website to their social media. We have worked hand in hand with FTBA since the business conception, working closely with Steven James and his team to create everything from the business name, logos and branding to optimising conversion rates on their lead generation forms. The current version of their website is responsive and has been built with their ideal client in mind. From the copy, to images and social media integration everything has been incorporated to improve their branding and build trust with their audience. The site’s backend is equipped with custom google analytics integrations, heat maps, Facebook advertising re-marketing tracking and Adwords tracking. This allows FTBA to understand exactly where there clients are coming from and react accordingly. Beyond the web presence we have worked with Find The Best Agent on radio advertising and print advertising. With statewide radio campaigns running across multiple stations promoting a free guide to real estate along with highly branded flyers, booklets and banners for open inspections and auctions FTBA has built a consistent brand that is easily recognised throughout the Melbourne real estate market. As a new business in Mornington, Lucky Thai Massage required the complete package. Logo design, website, branding and marketing. We began by building a custom website adhering to modern flat design and incorporating single page scrolling through the menu. This showcases all the information clients need, allowing them to find it quickly and easily. With their new branding and logos we created store signage that reflected their identity. 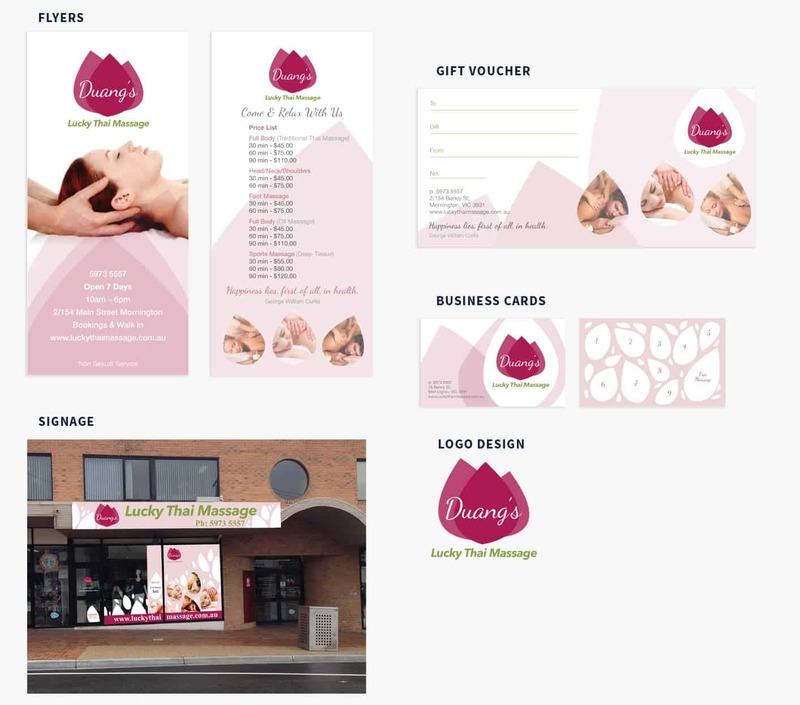 Along with gift vouchers, brochures, flyers and business cards Lucky Thai Massage quickly went from looking like a new business to looking professional and established. The website is responsive and complete with high quality photography of the massage parlours interior. We made sure it was simple to navigate as their clients are often looking for certain information eg. the price list. 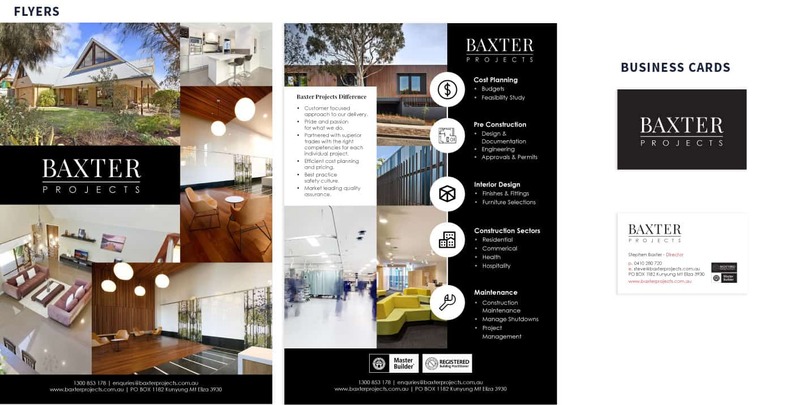 Baxter Projects, a multi-disciplined construction, renovation and fit-out company required a website and branding showcasing the quality and individuality of their projects. For the overall branding of Baxter Projects we chose a premium black and white design with high quality images displaying their previous work. This is displayed uniformly across their web properties and print media. The website features a vertical menu surrounded by imagery with a call to action placed centrally. This design showcases the beauty of Baxter Projects work while providing potential clients an easy method of communication. It is responsive, with easy to update modules allowing Baxter’s staff to make edits themselves and integrates with google my business and google webmaster console. We also worked with Baxter Projects on their print media, an important part of their business. 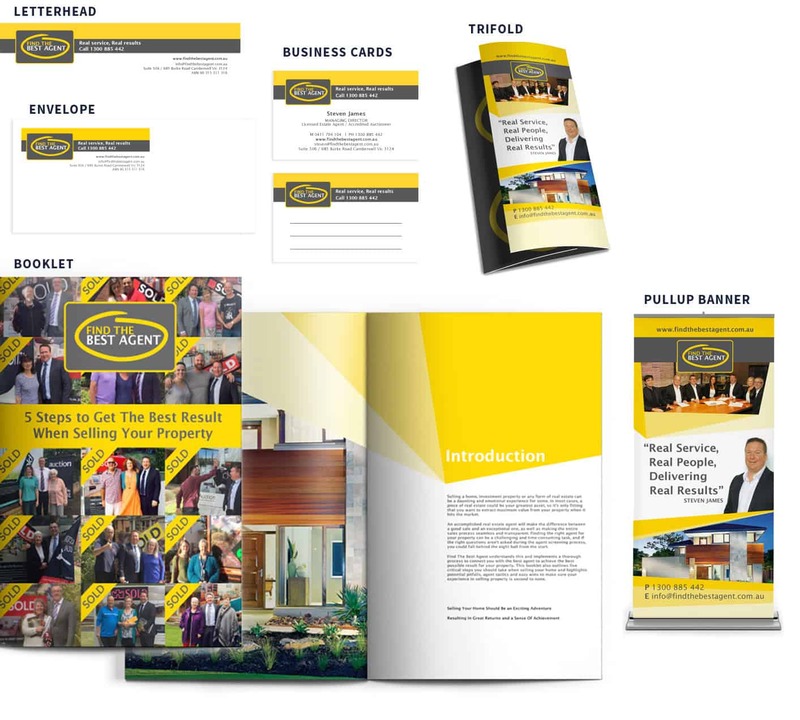 We designed and printed high quality, glossy, professional flyers and business cards the company required for events and to send to business leads. With our printing capabilities Baxter are always able to request more copies of their advertising material and have it printed quickly, locally and efficiently. 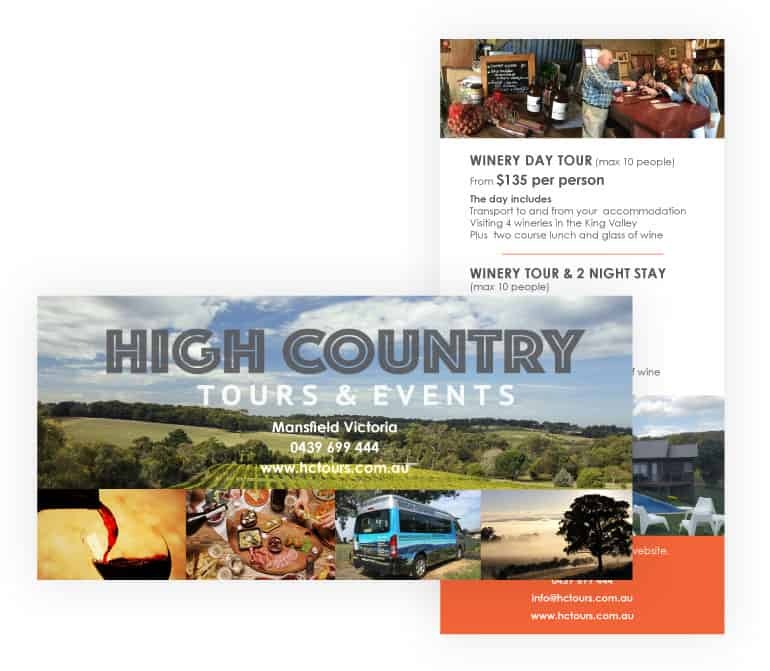 High Country Tours & Events required a website and various flyer designs for their business. We created a website showcasing their unique approach to tours with branding and a colour scheme they were happy with. The site is responsive, with easy to use modules the client can edit themselves, has email integration through Mailchimp, has an online chat feature and integrates with webmaster console and analytics. Their flyers highlight individual tours including wine day trips which contain all the information customers would require along with pictures designed to entice. They are printed on a high quality gloss paper in house here at Positive Design.